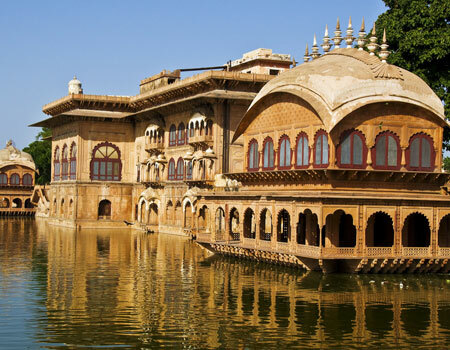 Bharatpur is a tiny yet popular destination in Rajasthan. The city houses the rarest of birds including Flamingoes, Siberian cranes, Falcons and three hundred and sixty other bird species. Bharatpur is a pilgrimage for bird lovers. The land is equally rich in flora. The forest area of the region is dominated by a blend of woodland and marshes. October to March is the best time to visit Bharatpur as the weather is quite pleasant during this time of the year. Bharatpur is famed far and near for its World Heritage. The Keoladeo Ghana National Park it houses, is major tourist attraction. All those visiting Bharatpur make it a point to see the Bharatpur bird sanctuary. It is equally popular amongst the non-bird watchers as well. The history of the land dates back to the 5th century when it was ruled by the Matsya kingdom (dynasty). But in the recent past, in the 18th century, Bharatpur was dominated by a Jat community. Later in the 19th century, the rulers signed the first friendship treaty between the North West states in India and the British East India Company. The Keoladeo Ghana National Park in Bharatpur draws hordes of tourists to this place every year during the winter months. The town also has some attractions for the tourists even though they pale before the charms of the sanctuary. Agra is the nearest airport and regular flights from Delhi, Lucknow and Mumbai connect Agra. Bharatpur is linked with all the main cities of the Rajasthan state and outside through a network of buses. Regular rail services connect Bharatpur with a number of cities in India.